The wait is over, and the Nikon D850 - the latest pro-level full-frame digital SLR from Nikon has been officially unveiled! Here we're breaking down the specs and comparing the Nikon D850 vs the Nikon D810. We already knew it was called the Nikon D850 thanks to an announcement on Nikon's 100th birthday hinting that something wicked this way comes, complete with teaser pictures and video. Now we can finally delve deeper into the D850's specifications, and tell you exactly what is different from the Nikon D850 vs the Nikon D810. One thing we are hearing from Nikon Towers is that the D810 will still exist as a standalone model, and will not be usurped by the newer addition to Nikon's full-frame family. Rest assured that the D850 is a powerhouse of a DSLR camera, and those eager for its arrival are in for a treat with a camera that will be hard to topple as the most exciting release of 2017. If you want to jump into straight down to the nitty gritty, take a look at our D850 vs D810 comparison table at the bottom of this article. Although the Nikon D810 is no slouch when it comes to image quality, with a still to-this-day impressive resolution of 36.3 Megapixels produced by a combination of a CMOS Full-Frame Sensor and Expeed 4 image processor, the Nikon D850 has managed to exceed this by adding a thoroughly impressive 9 more MP to the updated sensor, with a 45.7 effective megapixel FX-format full-frame CMOS sensor, paired with the latest EXPEED 5 image processing engine - the same you'll find in the Nikon D5. A key upgrade to the sensor in the newer Nikon DSLR is the introduction of a back-illuminated CMOS sensor, moving the sensor circuitry to the back of the sensor and enhancing both low-light capability and reducing noise by having the photodiode nearer the 'micro lens' on the front of the sensor. (Whilst technology has moved on in the past 5 years, this guide from our friends at Tech Radar does a good job of explaining sensor technology in further detail). It doesn't end here though, with a more resolution intensive camera requiring some intensely intelligent tech to ensure that image output is of the utmost quality. Thankfully the Expeed 5 Image processor (as used in their flagship DSLR the Nikon D5) is designed to also create less noise, meaning that low-light performance will be pretty outstanding. "The EXPEED 5 processor enables low noise shooting from the break of dawn to the last light of alpenglow." This can be roughly translated as impressive low light performance, and actually sees a resultant boost of ISO range from the D810's ISO 64-12,800 to the Nikon D850's ISO 64-25,600 (which now has an expandable ISO range of ISO 32-102,400). We think that this'll be an ideal combination of form and function when using the 8K time-lapse mode for some dreamy milky way shots in a phenomenal resolution that hasn't even hit the mainstream yet (as highlighted by their teaser video earlier this year). Note: you can shoot and compile 4K timelapse video in-camera, and shoot 8K timelapse using the cameras' interval shooting function but you'll need 3rd party software to compile the 8K images into a timelapse. You'll also benefit from the newly added button illuminations that'll let your camera guide your way much like the stars during your nocturnal photoshoots. There is an expectation for the modern camera of this standard to come with the latest video standard, which is for the timebeing 4K - which is double the resolution of Full HD at 3840 x 2160 pixels. 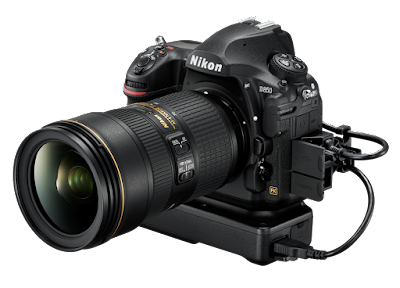 The Nikon D810 was at the time of its launch complying to the standards of the time with its inclusion of 1080p Full HD video capture at 30p, and the D850 is complying to the standards of its time by including 4K video recording. 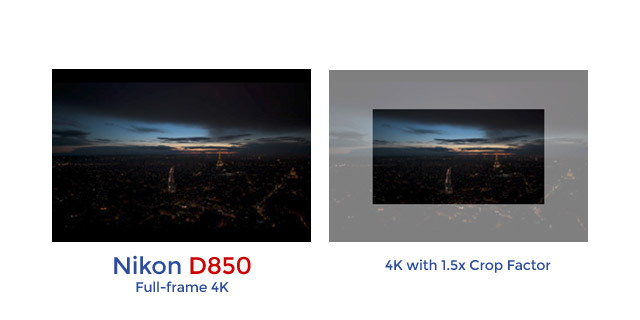 However, where the D850 once again excels over the D810 is to provide 4K capture without any sensor crop whatsoever. Utilising the full area of the full-frame sensor, meaning when you record video with a 35mm lens, your focal length is 35mm. Even the outstanding Nikon D5 has a crop factor of 1.5x when capturing 4k, meaning a 35mm lens on camera would actually result in an equivalent focal length of 52.5mm. The D850 is really benefiting from Nikon's previous experience with 4K and could well be a popular videographer's choice. Further improvements come in the ability to capture Full HD at 120fps, vs the 60fps in the D810, meaning you can get some really high quality slow motion footage - the more frames you capture, then the less juddery your footage will look when it comes to slowing it down. This video from YouTube shows the difference between slow motion footage when filmed at 30fps, 60fps and 120fps (shot using a GoPro) - and really pushes the virtues of that higher frame rate if you are interested in slowing things down! The Nikon D810 shared its Autofocus system with the, at that time, flagship Nikon D4 and the later released Nikon D4s - meaning it had 51-points for auto focusing, of which 15 were cross type. 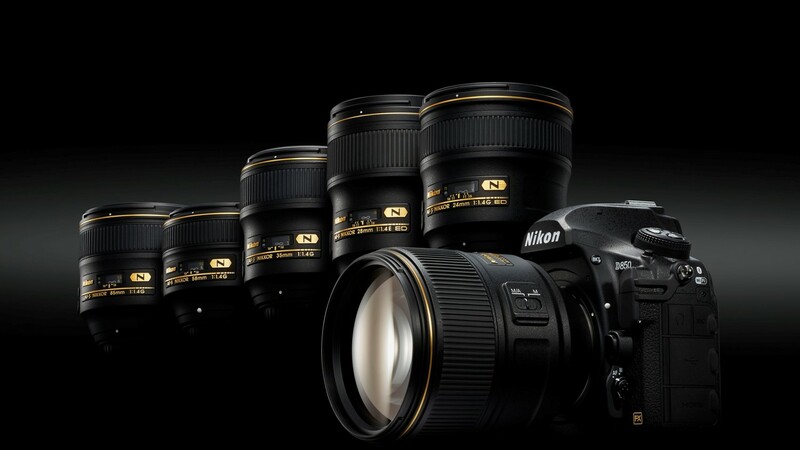 Potential purchaser's will therefore be excited to hear that the Nikon D850 has pinched the AF system from the current head of the family, the Nikon D5. This means that there is a threefold increase in number of focus points - now toting a whopping 153-points, of which 99 are cross type. Read this article from 'Cambridge in Colour' for a deeper analysis into AF and cross-type vs normal AF points if you want to know more why the 99 cross-type points will provide a much larger benefit to users than the 15. In summary, cross-type sensors deliver higher accuracy - so the more, the better! 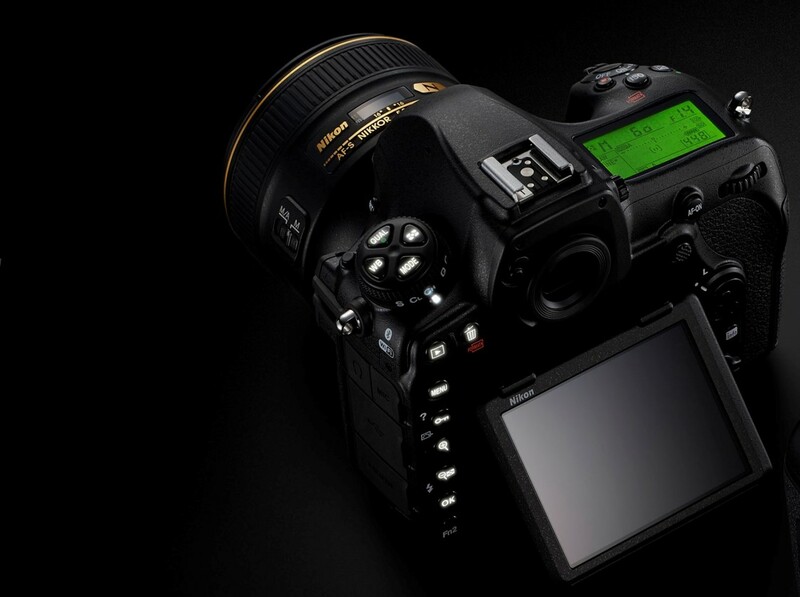 As many a pro will be using the Nikon D850 as their main camera, the battery will be required to have a high capacity with a large shot count. The Nikon D810 provided 1,200 shots on a single charge of its EN-EL15 battery - which is a figure that would still be lauded if the D850 could match it. As is the theme of this comparison, once again Nikon have pushed the boat out with their upgraded DSLR and have managed to use the newer, higher capacity, Nikon EN-EL15a battery to manage a nothing short of spectacular 1,840 shots from a single charge! Filming should also last for around 70 minutes, whether or not this will be for full 4K capture remains to be seen once full specs have been released. The wow doesn't stop here though. 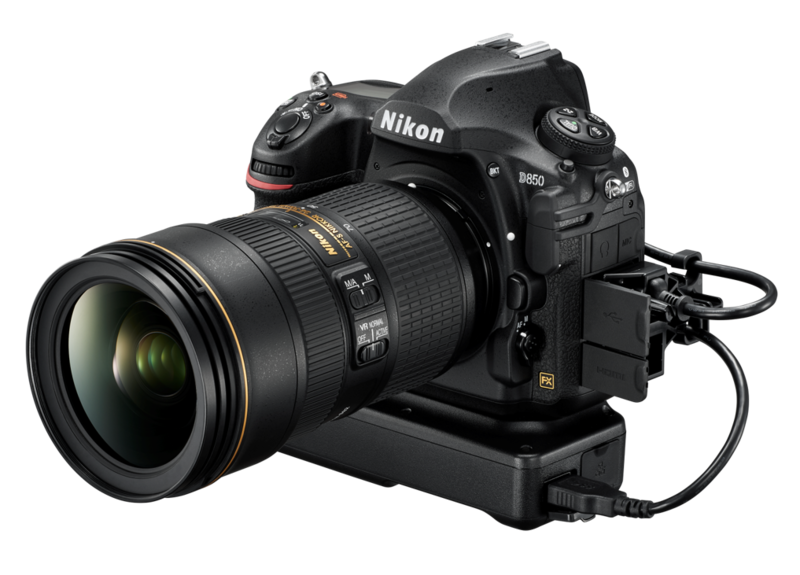 Their official battery grip, the Nikon MB-D18, will take that total up to an absolutely positively ridiculous 5,140 images - and will increase the 4K capture time to film feature lengths the size of Ben Hur (once again actual real life numbers to be confirmed!). If that wasn't enough to sway your decision on whether the battery grip is an optional accessory or a must have, then take into account that the added energy will unleash the true power of the camera's continuous mode. The number of shots that can be continuously captured has already increased from the D810's respectable 5fps to a more respectable 7fps which will be pleasing to those chasing faster things. However, as per the D810, when combined with the battery grip, this figure actually increases owing to there being a bit more juice in the tank. With the D810, when using the compatible grip you could shoot 7fps in DX mode (meaning there would be cropping). As has been the theme of this blog, not only can you increase the capture of continuous still images to 9 frames per second when using the Nikon D850 + MB-D18 Battery Grip, you don't have to adopt DX mode, resulting in 9 full-frame images per second. It shouldn't come as a surprise that the newer camera also has a vastly improved LCD screen. Once again, Nikon have chucked the latest technological resources available to them into this element of their latest camera. A greater resolution means that when reviewing your pictures you're likely to get a better representation of your actual output. The D810 had a 1,229K Dot Resolution which has been doubled in the D850 to 2,360K. Adding a tilting screen and touchscreen control, this becomes a camera that has clearly thought about user convenience by adopting these features. Another tick for the user convenience box is the addition of the latest wireless connectivity tech ensuring that photographers can control their camera from an app - or more likely for a product of this calibre, transfer without the need for any physical cables to connect. The D810 was bereft of any wireless communication, but that was more a sign of the times as it wasn't as much of a thought for camera manufacturers when it was released. However the inclusion of Wi-Fi and Bluetooth is more of a modern expectation for the D850 and would've been an odd one not to build in. Back in July when the pre-announcement of the actual announcement was made, we compiled some conjecture in our blog to say what we thought we might see in the Nikon D850. Taking into account that we were as blind to information as the public at this point we went slightly cautiously when thinking about what memory card form they would choose for the newer Digital SLR camera. So we posed the question, will it have dual XQD card slots? Unlike the D5, the answer here is no! BUT the good news is that the newer memory format has made it in singular form, replacing the CompactFlash slot found in the older D810 with an XQD slot. The SD card slot remains in place, however with the extra bonus that it supports SD cards that are UHS-II compatible, for ultra fast write and read speeds to fill the requirements that Ultra HD video recording and really fast full-frame 45.4 megapixel still image capture needs. Look, the D810 was (and still is) an absolutely brilliant full-frame camera. The 36.3 MP sensor still stands the test of time and is unmatched by some of the newer DSLRs to the market. But, the D850 is simply better in every single way. This has been far from an iterative update which we see from time to time with camera manufacturers tweaking rather than overhauling. There is no doubt that this is an overhaul that will propel the Nikon D850 into the kitbags of many a professional camera, and will turn the heads of those Nikon fans who have been tempted to join the full-frame revolution. Often when new cameras come out, the doubters emerge from the woodwork criticising the inclusion of one technology and the omission of another. If the D850 doesn't manage to silence the doubters we would be very surprised, with every possible upgrade made to this full-frame camera to make it one of the best on offer in the current market. This revolutionary approach to enhancing this model will no doubt make the D850 one of, if not the, best camera releases in 2017. Well, I was just about to buy a 810 and probably still will due to the extra cost for the 850, but there's no doubt the 850 has fantastic specs and would be my camera of choice if I could afford one ! This is a great post! This is an exciting development and no doubt a hotly awaited release. The spec looks great so hopefully it'll deliver as a product! I am looking forward to trying out a D850 soon, I hope its as good as the specs look. I have still a legendary D700 with 350 000 shoot count :) I was thinking about change this camera on D810, but now I wonder about d850. It seems great :) I hope the price will drop a little.